Nuns have had a lengthy cinematic history, being the focus of films like BLACK NARCISSUS, THE NUN’S STORY and recently NOVITIATE. 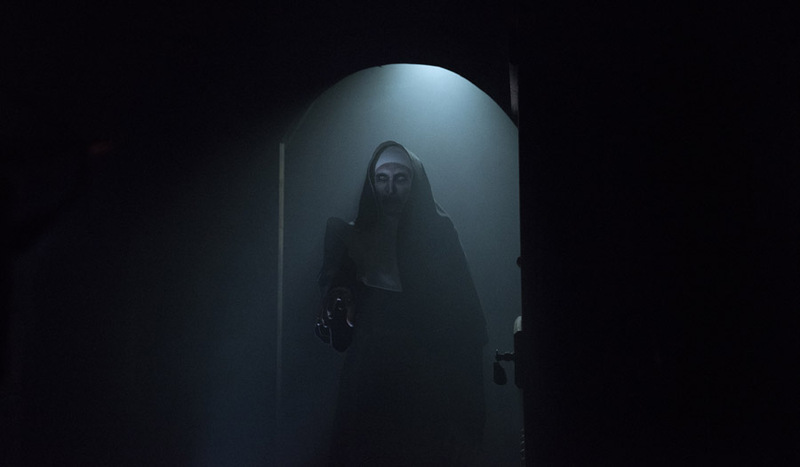 Though they’ve played a part in the long-running fear for many a Catholic schoolkid, it was THE CONJURING 2’s breakout spook – “The Nun” (played by Bonnie Aarons) – that helped to solidify that horrific link. Now she’s back in her own movie, THE NUN! And, in grand franchise tradition, director Corin Hardy’s scary film bequeaths audiences with another scene-stealing star – Jonas Bloquet. Bloquet’s character, Frenchie, is the heart and humor, bringing charm and levity to the spooky sheNUNigans. In the film Father Burke (Demián Bichir) and Sister Irene (Taissa Farmiga) travel to a remote haunted abbey to investigate alleged supernatural stirrings. Of course, after Frenchie (Bloquet) cautiously leads them into the cloistered convent, there’s no miracles to be found and mayhem ensues. We recently spoke with the affable actor about everything from the film’s ad-libs, to the training required to work with the horse, to what it’s like to become a member of the CONJURING Universe. What was your experience like with Nuns before getting cast and did doing this movie change your opinions on them? I don’t know if I had an opinion on Nuns – I’m not a very religious guy. The whole experience working with Corin Hardy, the crew, Taissa, Demián, Bonnie and everybody else, it was just amazing. Shooting in Romania in real locations and in Transylvania, that was perfect. It seems like it’s an actor’s dream to be a part of any franchise. Let’s talk a little about what it means to you to be a member of the CONJURING universe. It’s very simple. I love horror films. I’m one of the biggest fans of the CONJURING Universe. I’ve watched the CONJURING movies two times in theaters – and I have the DVD’s at home. We watch them five or six times, with my girlfriend. When I heard I got into THE NUN, I was so excited. So excited. What are some of your other favorite horror movies? I love David Cronenberg’s THE FLY. THE SHINING is one of my favorites. ROSEMARY’S BABY is another. And I love ALIEN. ALIEN is my favorite of all. You mentioned real locations. Did the graveyard scene take place on a soundstage or were these night shoots? Yeah. Night shoots. It was really close to the abbey. You’re on a set, there are lots of lights and there’s like thirty people. There’s a lot of noises. It’s not that scary. But when there’s no more noise and you can’t see the other people around you, that’s terrifying. When you see “The Nun” walking, and you know it’s fictional, it’s easier to act in those circumstances than in an empty studio. When it comes to the scenes where your character is scared or taken off-guard, do you want to be surprised by Bonnie in full wardrobe and make-up that you try to avoid seeing her until filming to get a pure reaction? [laughs] Unfortunately, I didn’t have the choice, so I had to see them before. You can see Bonnie Aarons ten thousand times a day and she’ll still be scary to me. She’s scared me on the first take and she scared me on the last take. Bonnie Aarons in THE NUN. Courtesy of Warner Bros. Pictures. Did you ad-lib either the line “I’m French-Canadian,” or grabbing the cross from the graveyard? Those lines get a big audience reaction. Actually, we had lots of options for the line, “I’m French-Canadian.” They chose that one, but I proposed something else, which was, “You talk too much.” I thought that was funny. The graveyard scene was, yeah, something I added. That was an improv. Was it easy to collaborate with Corin to find those nuanced moments where you can bring something to your character that wasn’t necessarily on the page? Oh yeah. The first time I met Corin, we talked about horror references. When I met him face-to-face, I told him that in the script, I was afraid that my character was just “the funny one.” So we tried to find nuances to add emotional stuff – some real stuff. Thanks to him and our work, we were able to do that. I also loved your delivery on the line where, when you show Father Burke the dead body in the cold storage room, you say, “But that’s not where I left the body.” It’s such a great horror movie moment. It’s delivered with such conviction and in lesser hands, it could be something that comes across as goofy. Thank you very much. That was one of the scenes I auditioned with. That was the second one, the first was the first scene where I meet Sister Irene and Father Burke in my house. You worked with a horse, too. Whenever I’ve spoken with actors, I’ve learned there’s always a story about the horse. They are professional horses so they are so easy to ride. I had a rehearsal a week before filming with the real California Cowboys. We were an hour away from Los Angeles. I took two hours of lessons with them. They are amazing people. They made a hundred big movies. It was pretty easy for me. Even when pulling the cart they hit their mark? Yeah. When you first show them the path, they keep it in mind and then it’s easy. You just have to pull a bit on the left and they know where they have to go. So I can concentrate on my acting and trust them. You’re a director as well. What sort of wisdom have you absorbed working with filmmakers like Corin and James Wan, if he was on set at all, Kevin Costner, Paul Verhoeven and Luc Besson? That’s the thing. I’ve worked with amazing directors – very experienced. They all offer me something different. For example, Corin Hardy… when you put a great energy on the set then the whole crew is happy to be there – happy to work with and for him to do a great movie. That’s one of the most important things for a director to do. It’s so nice to be on set and you don’t want to leave to go back to the hotel. I learned lots of stuff with James Wan. I worked with him for two days when we were doing reshoots and that’s the same thing. He’s always positive. He always has good words to give you. Even if the first take, or the first few takes aren’t perfect, he always comes and congratulates you and encourages you to make it better. THE NUN opens on September 7.